Freeze Dried Raspberries, or 100's & 1000's, or both! 1. Begin by making the pastry. Cream the butter and sugar together in a large mixing bowl. Beat in the egg then blend in the flour until the dough comes together. 2. Chill the pastry for 30 minutes. 3. Pre-heat oven to 195°C/180°C fan/Gas mark 5. 4. Prepare a large roasting tray by lining with non-stick greaseproof paper. 5. Divide the pastry into two halves and on a well-floured surface roll out one half of the pastry as thin as you can get it, around 2-3mm thickness. 6. Cut the rolled pastry into 8cm x 10cm rectangles and place onto the prepared baking tray. 7. Place a tablespoon of raspberry jam onto the centre of each tart, spread the jam a little, leave a gap of 1.5 cm around the edge so there is space to seal the tarts. 8. For the tart lids, repeat rolling out the pastry to the same thickness and cut to the same dimensions. Top each tart with a lid and prick each lid with a fork or a skewer so the air can escape during baking. Crimp the edges of each tart with a fork to seal the edges. 9. Place the tarts in the preheated oven for 10-12 minutes, until the tarts are a light golden in colour. Allow to cool completely. 10. To decorate mix together the icing sugar and lemon juice. Spoon the icing over each tart and finish with a sprinkle of 100s & 1000s. Now older and wiser, I do question the health benefits of eating these pastry treats for breakfast! I recommend serving them as a special treat for a weekend brunch, as a dessert or for afternoon tea. If you don't own a rolling pin, a bottle of wine does the job just as well. 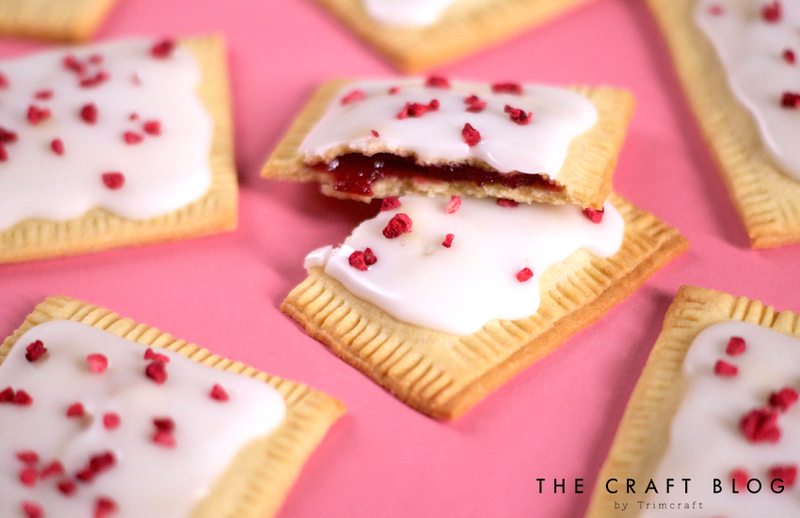 The recipe works with other jams too, why not try another classic Poptart flavour, such as strawberry or blueberry? Disclaimer: Whilst Poptarts are traditionally popped in the toaster, these are baked and we don’t advise toasting them!